The M20047-1 antenna module comprises an SMD antenna with built-in active components: an LNA filter and SAW to boost antenna performance — so designers will not need to add these — all contained in a compact FR4 part with low power consumption, measuring just 7.0 millimeters x 7.0 millimeters x 0.9 millimeters, and weighing less than 2 grams. The clear-out area required by the antenna module is only 7.0 millimeters x 5.0 millimeters. This, with its tiny size makes the M20047-1 well suited for small positioning devices where space on the PCB is tight, for example in wearable devices, asset tracking, sports cameras and equipment and smart watches. The M20047-1 is a useful alternative to Antenova’s existing “Sinica” antenna, part no SR4G008, which the company also recommends for accurate positioning. 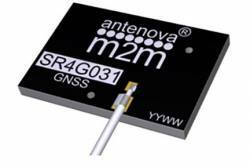 Antenova’s antennas are specifically designed for easy integration and the datasheet and evaluation kit for the M20047-1 are available from www.antenova.com. The company also provides full engineering support, antenna testing, tuning and integration for its customers.